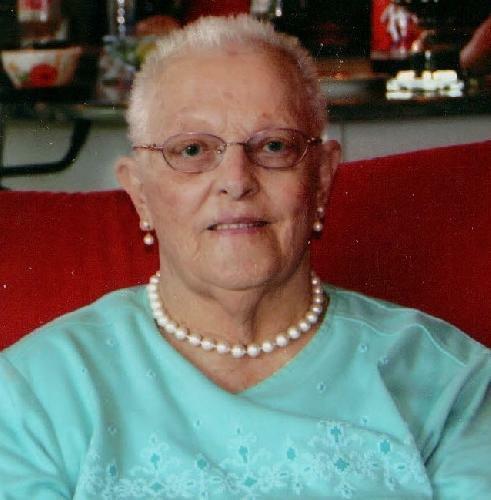 Trena Dieterman age 82 of McBain went home to be with her Lord at her home on Oct. 14, 2013. She was born on March 11, 1931 to Dries & Johanna (Velting) Dodde. She married Morris Dieterman on June 23, 1952 at the Dodde family home near Vogel Center. Trena worked at several different places including, Keeler Brass, Riverside Electric, drove school bus for the McBain School System, was the deputy treasurer for Riverside Township for many years, and worked on their family farm doing field work . Trena enjoyed lighthouses, playing euchre, crocheting, Sudoku, watching the Detroit Tigers,eating out, attending Christian concerts and the music of the Gaithers & Swaggerts. She was also a volunteer for the surplus commodities program and an active member of Calvin Christian Reformed Church. Trena is survived by her husband, Morris Dieterman of McBain, children, Lugene (Kay) Dieterman of Tampa, Florida, Marla (Ken) Heuker of McBain, Leann Wiltzer of Cadillac, Jerri (Joey) Lamb of Saugatuk, and Von Onderko and friend Jim Flynn of Grand Rapids, and a deceased daughter, Jodi Dieterman. Preceded in death by: Granddaughter, Mika Marie Malone, Brother, Marvin Dodde, Nephew, Arthur Dodde, Siblings, Andrew Dodde, Josie Dodde, Harm Dodde & Alice VanHuizen, brother inlaw: Garry Baas. Trena also leaves behind her loving granddog, Buddy. Funeral services will be held 11:00 A.M. Saturday, Oct. 19, 2013, at the Burkholder Family Funeral Home, 211 N. Pine Street, McBain, 231-825-8191. Officiating: Rev. Ken Koning and Rev. Seth Finch. Burial will take place in the Riverside Township Cemetery. Visitation will be at the funeral home on Friday, from 5:00 P.M. to 8:00 P.M. and one hour prior to services on Saturday. A luncheon will follow at the funeral home.